Afidium is a consulting company specialised in the tourism industry and counts 4 members. Afidium main expertise is in the travel related system interoperability to allow GDS to front office connections, to develop online selling platforms for tour operators or vendors in general, to synchronise front and back office platforms. Afidium has participated in the development of the XFT language (Exchange for Travel) a few years ago and is greatly involved in the evolution and implementation of XFT transactions by vendors and distributors. 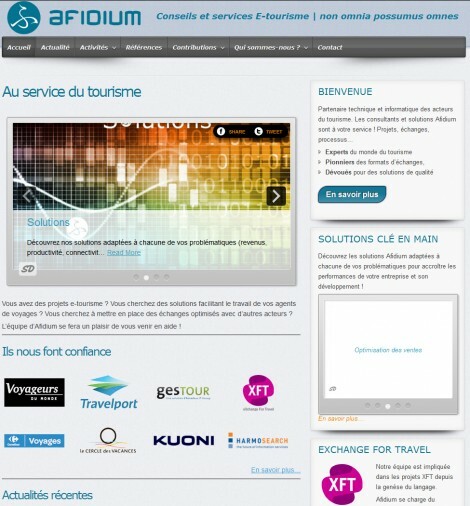 Afidium has around 30 customers mostly in France, all of them in the tourism industry, ranging from Travelport and Amadeus to small tour operators of a few people, including networks, associations and service companies. Interoperability and dynamic exchanges between companies is becoming crucial due to the emergence of online players and the needs for real time availabilities and quotes. However, many companies involved in the travel industry, even technical companies, have issues mastering new technologies like XML (and therefore and XML based languages and transformations), web services, or even classes. As a consequence, since last year we have developed (with the help of a technology partner) a platform that allows quick developments of connectors or transcoders. It is not like the Harmonise project in the sense that it still requires development, but it allows Afidium to provide quick and efficient solutions to certain customers. On top of the interoperability consulting services, Afidium also provides project management, training, auditing services or requirement definition services.